Western media has tried to paint a picture of a Venezuela on the verge of a collapse, coup or catastrophe, in which Venezuelan President Nicolas Maduro increasingly desperately clings to power against the wishes and needs of his own people. However, two reporters inside the country told Sputnik this is very far from the truth. In reality, three quarters of the international community is behind Maduro, and the country is operating more or less as normally as it was before Juan Guaido, the speaker of the country's National Assembly, declared himself to be interim president on January 23. Moreover, Maduro's caution and skepticism of the Trojan horse of international humanitarian aid is completely justified, given the figures in Washington who are overseeing it, two journalists in Venezuela told Sputnik Monday. 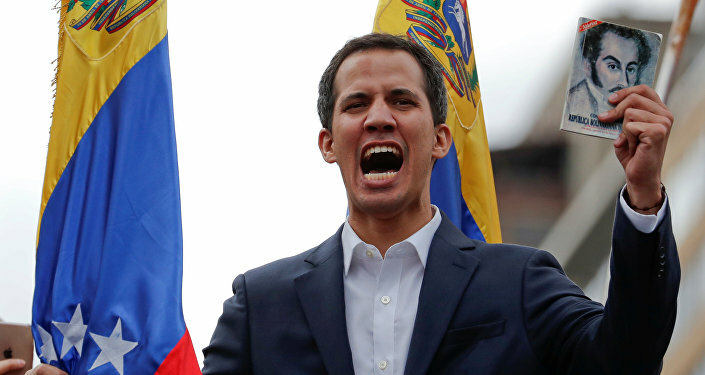 Guaido, along with his international backers in Washington and abroad, has made increasingly dire predictions about the impending humanitarian catastrophe in Venezuela if Maduro's government is not overthrown quickly. Guaido told AFP on Saturday that 300,000 Venezuelans could die without food and medical aid, and the pro-coup narrative, as articulated by the mainstream media and Western politicians, is that Maduro is blocking that aid from entering the country. 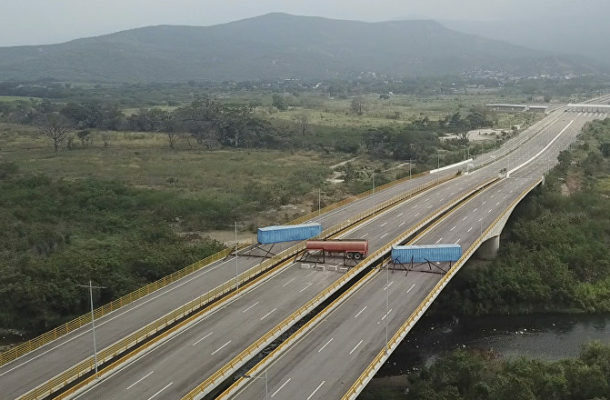 An image of the Tienditas Bridge, which spans the Tachira River between Tachira state in Venezuela and Norte de Santander in Colombia, barricaded with shipping containers has become the damning evidence of Maduro's supposed tyranny. ​Radio Sputnik's Loud and Clear spoke with two reporters in Venezuela from Venezuelanalysis.com Monday: Paul Dobson, who reported from Merida; and Lucas Koerner, who spoke to Sputnik from the capital of Caracas. ​Day-to-Day Life in Venezuela Uninterrupted "Caracas and most of the country continues largely as normal," Koerner told Sputnik. "Just people going about their daily lives, you know, going to market, shopping for some products, children going to school, et cetera. There really has not been any interruption whatsoever, and Juan Guaido remains largely a virtual presence, reappearing every once in a while to call and remind opposition forces to try and overthrow the government, but having no capacity whatsoever to make that a reality." Dobson basically agreed with Koerner's characterization, although noting it "has to be contextualized a little bit." Koerner told hosts Brian Becker and John Kiriakou that the Tienditas Bridge, infamously blocked by a trio of containers and a barricade, wasn't closed last week at the behest of Maduro, as seemingly every major news source has reported — in fact, it had never been open in the first place. The Los Angeles-based La Opinion lamented in 2016 that the $32 million dollar bridge had remained closed since its completion a year prior due to the declining political situation between Colombia and Venezuela. In August 2015, Maduro closed the border in response to Colombian militias allegedly being involved in an attack on Venezuelan troops in Tachira and to stop speculation in Colombia on the sale of goods bought in state-subsidized Venezuelan stores. "The strong price controls that the Venezuelan government has applied to many basic goods has made it extremely profitable to buy just about anything cheaply in Venezuela and smuggle it into neighboring Colombia, where no such price controls exist and the local currency, the peso, is significantly stronger," Time magazine reported in March 2016. "It's not the Maduro government that is questioning this US effort to bring in aid; it's actually the United Nations and the Red Cross who have denounced this as a political effort to effectively instrumentalize humanitarian aid as a means of toppling a government," Koerner told Sputnik. "The International Red Cross and Red Crescent Movement reaffirms that in order to ensure the fulfillment of its exclusively humanitarian mission and, according to the fundamental principles of impartiality, neutrality and independence, it cannot take part in the initiatives to hand over assistance for Venezuela from Colombia," the two organizations said in a joint statement. On top of that, Elliot Abrams, US President Donald Trump's special envoy to Venezuela, "is on the record having authorized US humanitarian planes to carry weapons to US-backed Contra death squads in Nicaragua" in the 1980s, Koerner noted. Indeed, as part of a plea deal, Abrams pleaded guilty in 1991 to having withheld information from Congress. However, Independent Counsel Lawrence Walsh's case against Abrams details his coordination of the Iran-Contra Scandal on the Central American side. "Maduro would have utterly no survival instinct if he allowed this aid to enter in these circumstances," Koerner said. Fears of a repeat play by Abrams were vindicated last Tuesday when Venezuelan authorities confiscated dozens of arms and ammunition boxes on a plane that flew from Miami, Florida, in the US to Arturo Michelena International Airport in Valencia, Sputnik reported. Who is Really With Guaido? Dobson noted that "only 25 percent of the world's governments have actually recognized Juan Guaido, the man who is attempting to carry out a coup d'etat here. Ergo, 75 percent of the world is continuing to recognize the elected government of Nicolas Maduro. Now when you break this down by regions, you can see very clearly around 98 percent of Africa, 97 percent of Asia and something like 99 percent of the Middle East are all continuing normal diplomatic relations with the Venezuelan government. When you look at the regions of the Americas and Europe, only around 50 percent… have actually recognized Juan Guaido." "So we can clearly see from this sort of data that his claims and the White House claims that the world is with him and the world is turning its back on Nicolas Maduro are quite clearly false," Dobson said. Sputnik has previously reported on how 80 percent of Venezuelans had never heard of Guiado before his January 23 declaration. However, even within Venezuela's opposition, Guaido's move took people by surprise, including those on the stage with him when he announced his interim presidency. Koerner further noted that Henrique Capriles, the former opposition leader who served as Hugo Chavez's, and then later's Maduro's perennial political rival, was equally taken by surprise. "On January 5, when Guaidó took possession of the Assembly (Parliament), the majority position within the Venezuelan opposition was that Guaidó should not swear himself in as president. It was considered that this could trigger a political confrontation," Capriles told El Nuevo Herald, the Spanish-language sister paper of the Miami Herald, on January 31. "On January 23, when Juan was sworn in, we did not have the information. It surprised many leaders." Noting that the opposition faction pushing the coup as well as intervention is the Popular Will party founded by Leopoldo Lopez, a child of US elite institutions and State Department programs, Koerner pointed out that "this faction is very nakedly calling, seeking international intervention," and that it "associates its legitimacy precisely with that intervention as opposed to having any kind of democratic legitimacy of its own from elections, as Nicolas Maduro retains as a result of the May 20  presidential elections, in which he won over 6.2 million votes." The contradiction hasn't escaped even the editors of the Wall Street Journal, whom nobody could accuse of being pro-Maduro. The paper's front page headline Thursday read: "‘What the hell is going on?' How a small group seized control of Venezuela's opposition." Noting how even mainstream media sources like the Washington Post have begun using the term "coup d'etat," Dobson told Sputnik that "this attempted coup d'etat has essentially become undefendable, even by the most staunch allies of US imperialism." He further noted the BBC and CNN have slowly changed their tone in the last few weeks, accepting that Maduro's government still enjoys mass support, which has only further rallied international support for the ideals of self-determination. "This can only be considered a partial victory for truth," Dobson said. That said, Dobson pointed out that "the US establishment" has "lined up, one behind the other, to throw mud at the Maduro regime and basically throw mud at the Venezuelan democratic system." The movements against intervention outside and inside the country have linked up in many ways. Maduro's "Open Letter to the People of the United States," which he hopes to have 10 million Venezuelans sign in Caracas' Simon de Bolivar Square, has been distributed in booklets that bear a slogan used by English-language protesters against the attempted coup around the world, including the United States: "Hands off Venezuela." "Washington has really put the cart before the horse and went ahead with recognizing a government that is nowhere closer — I mean we're how many weeks, we're over two weeks into this, and they're nowhere closer to actually installing this government as a power," Koerner said. "There's really a danger here, because Washington has — the Trump administration has banked a lot of political capital on this. And moreover, when we look economically at these sanctions, the new oil embargo that has been imposed has basically [suspended] the secondary market for bonds for Venezuela's state and oil company bonds. This means that if the government is not toppled soon that these bondholders stand to lose a lot from their non-payment. So, this really leaves us with a closing window for Washington to achieve regime change."